Phuket Golf Courses are World Class! As an avid golfer I can't think of a better way to start the day then playing a round of golf on one of the 8 fantastic golf course’s in Phuket. The beach, bars & shopping can wait.. 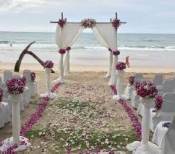 Golf in Phuket started from a small beginning with the first course located at Surin Beach. As development moved in part of the area has now made into a park. Playing golf in Phuket is a little bit more expensive then playing a game on a course near Bangkok or Pattaya, but it is well worth it! If you are staying in Patong you are spoilt for choice, just 8 km away, there is the Phuket Country Club with 27 holes, Loch Palm with 18 holes and Red Mountain with 18 holes which winds through the old tin mine. Up to the North of the island you have the Laguna Phuket Golf Club which is located in the Laguna Complex at Bang Tao Beach and not far up the road there is Blue Canyon Country Club offering their 2 courses the Canyon and the Lakes. On the North Eastern side of the island is where you will find Mission Hills Golf Resort and Spa looking out onto Phang Nga Bay. The surprise gem is the Thai Muang Golf Club located on the Thai mainland around 30 minutes north of Phuket Airport, this course is well worth the drive. There are many golf package tour companies that you can book through, but it is worth checking the individual courses websites to find any specials. A good example was the junior special at the Loch Palm Golf Course, 400 Baht for a junior under 15 or a discount for booking online. 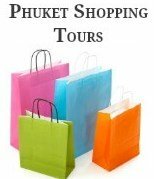 It is also worth remembering to add up the extra’s, such as travelling to the course, buggy and club hire, caddy fees (all Phuket golf courses require you to hire caddies) and tips so that you don’t get any surprises. Just beware that some of the hire clubs come with a wicked slice (just joking) a good golfer always blames his clubs, and also take a few spare balls as there is plenty of water. If you plan to have a round of golf ensure you pack appropriate clothing, short or long pants and a collared shirt as a singlets just won't cut it. 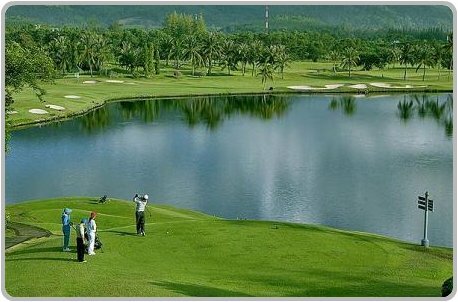 Having a holiday in Phuket is not complete without a game of golf on one of the well presented Phuket Golf Courses. Would you like to share with us which is your favorite golf hole and golf course in Phuket. Tell us if you scored a hole in ONE or if you had a disaster on one of the many water holes. If you have a photo or video add this along with your story for all to enjoy.